I didn’t want to share the summary for fear that someone may not have read the first book, In the After and would get spoilers. That said, I think I may have already posted the summary awhile back as a Mindset Monday post. This was an excellent finale to In the After! I was glad to see Amy’s growth and determination in getting done what she needed to. Plus, I loved the addition of Jacks. He was such a great character that I forgot about Rice for awhile. In the End added a huge depth to the story that was set up in the first book and I was excited that it grew and expanded as far as the beginnings of the Florae. When we left Amy in the last book, she was alone and going to find Fort Black and Kay’s brother Ken. Her journey inside Fort Black was never boring and always had new excitement luring just around the corner. I highly suggest reading In the After if you haven’t already and then reading this one. Great duo! 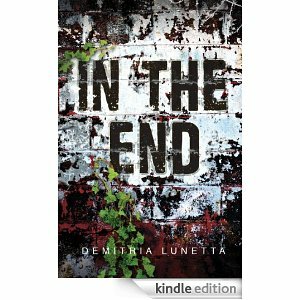 I’m on board for whatever Demitria writes in the future for sure. 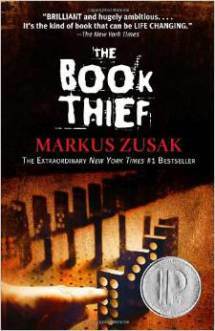 I’ve been wanting to read and see the movie The Book Thief for awhile, so I’m glad to see someone do a comparison review! I’m not sure if I mentioned it before, but I got into audiobooks this past school year because of my 2 hours in the car driving to and from work each day. I reviewed a few already (Paper Towns and 1 or 2 of the Mortal Instruments books that I can recall…), but I recently got connected into reviewing audiobooks. Obviously, I’m not working for the next month, but you can expect to start seeing more audiobooks come August. With that in mind, I’m wondering what the most popular audiobook options are. I honestly don’t have a preference and swap between cds and streaming audible through my phone via my FM transmitter. I do kind of prefer mp3 or and app just because then I don’t have to change cds out as I’m driving down the road. Anywho, I already have one book coming my way in August, so I’m excited about this change and getting to review for others like myself who tend to rely on audiobooks! Some memories are better left forgotten After a daring escape from the Diotech scientists who created her, Seraphina and Zen believe they are finally safe from the horrors of her past. But new threats await them at every turn as Zen falls prey to a mysterious illness and Sera’s extraordinary abilities make it more and more difficult to stay hidden. Meanwhile, Diotech has developed a dangerous new weapon designed to apprehend Sera. A weapon that even Sera will be powerless to stop. Her only hope of saving Zen’s life and defeating the company that made her is a secret buried deep within her mind. A secret that Diotech will kill to protect. And it won’t stay forgotten for long. 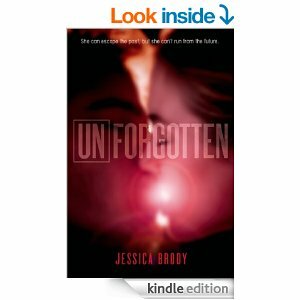 Packed with mystery, suspense, and romance, Unforgotten is the riveting second installment of Jessica Brody’s Unremembered trilogy, and delivers more heart-pounding action as loyalties are tested, love becomes a weapon, and no one’s memories are safe. I hope this is as great as the first book, UnRemembered, was. Look for the review in a day or two. I bought Delirium months ago when it was, I think, a daily deal on Kindle. I can’t pass up $1.99 on a book I’ve been wanting to read. Just can’t. Anywho, at the time I was pretty much burnt out on all things dystopia. I still am actually, but the hype over the tv pilot being on Hulu got me interested, if only so I could watch the pilot. I’m SO glad I took a chance on it! 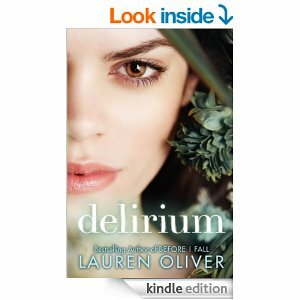 Delirium was refreshing and different from other dystopias I’ve read. I love the idea of love being outlawed and considered a disease. Very different! It did start out slightly slow for me, but it quickly picked up and then I couldn’t put it down. However, I think my favorite thing might have been the pieces of history and laws at the beginning of each chapter. I just like when books do things like that to open each chapter, especially if it gives hints of things to come. I will say too that I gave the pilot a go and I think that it had potential, but I can’t see it being on Fox–which I THINK it was it was made for. It would’ve survived on CW or even Mtv for sure though. Plus, there were so many changes! I expect that, but it just seems like a tv show has so much more that it could do in terms of sticking to the story. …I say that, but I’m hopelessly addicted to Pretty Little Liars and the TV show essentially has NOTHING to do with the books. All in all, I’ve already bought book two, so I’m hoping to make it to it before work starts back in August because that ending…THAT ENDING. SO GOOD. Lauren Oliver’s powerful New York Times bestselling novel Delirium—the first in a dystopian trilogy—presents a world as terrifying as George Orwell’s 1984 and a romance as true asRomeo & Juliet. In an alternate United States, love has been declared a dangerous disease, and the government forces everyone who reaches eighteen to have a procedure called the Cure. Living with her aunt, uncle, and cousins in Portland, Maine, Lena Haloway is very much looking forward to being cured and living a safe, predictable life. She watched love destroy her mother and isn’t about to make the same mistakes. Delirium received starred reviews from Kirkus and School Library Journal, and was named a Best Book of the Year by USA Today, Kirkus, Amazon.com, YALSA, and the Chicago Public Library and was selected as one of NPR’s Top 100 Best Ever Teen Novels. I bought Delirium months ago on my Kindle and am just now getting to it. I said I was done with Dystopia for awhile, but Hulu is putting the unaired tv pilot up for a couple of weeks and I wanted to watch it, so…I’m following true to my usual style and reading the book first. I find it interesting to air the pilot. If people like it then won’t that make the network that turned it down feel like they wasted their chance? I don’t know when the pilot was made, but it isn’t like they can immediately pick it back up with the same cast, I’m sure. Regardless, I’m not far in, but we’ll see where this goes. Hopefully it surprises me because I’m really tired of dystopia right now. If you need the summary, then flip back two posts to my “currently reading” post. I’d give LLttD 3.5 stars if I had to think on it. I liked the book as a whole, but I wasn’t surprised by anything and I did find myself making myself turn the page every now and then. Granted, it is still a great book, but it just didn’t live up to the hype I gave it in my head before hand. I think that it mostly just due to the fact that I was so excited over the ideas of letters telling the story. This is short mostly because I really don’t have much to say about it. 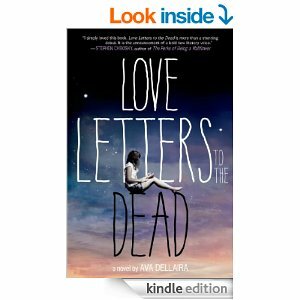 I still recommend Love Letters, just don’t have the extremely high hopes that I did. It is still an amazing first novel and I can only imagine how much the author can improve from this!